That’s the kind of directive you’ll get in college creative writing classes, interactive online workshops and, believe it or not, grad school. You’ll get it from the old pros and you’ll get it from frustrated young upstarts: “write what scares you.” David Lindsay Abaire is a prolific playwright with many hilarious plays under his belt, “Fuddy Meers” and “Kimberly Akimbo” among them. But it wasn’t until a mentor advised him to write what scared him most that he wrote what many consider his greatest play, “Rabbit Hole.” He was duly rewarded with a Pulitzer Prize. 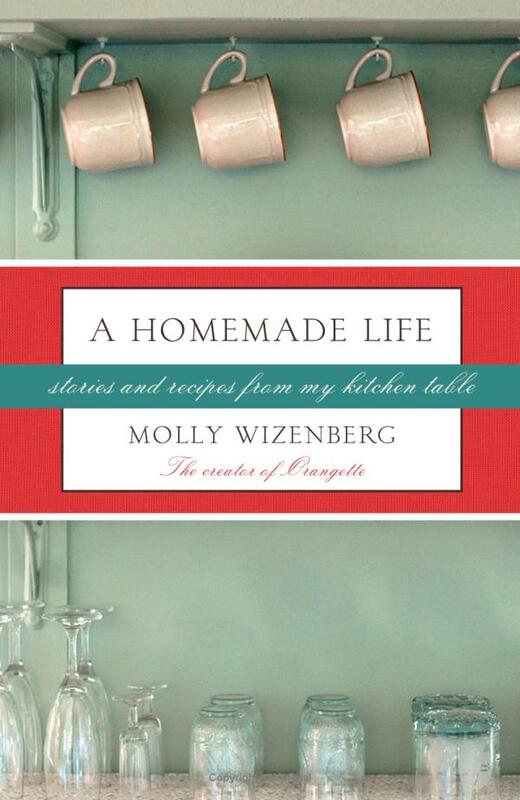 It’s abundantly clear, as you parse the pages of Molly Wizenberg’s beautiful new book “A Homemade Life,” that Molly is writing something that scares her. The book seems light at first, a fizzy frolic with recipes and anecdotes and cute little pictures of flowers and fruit. But contained in this book is something deeper, something darker, something that only a brave writer could write. It is, in essence, the story of her relationship with her father–a lovable man she called Burg (“a nickname my mother made up, a shortened version (and inexplicable misspelling) of our last name”), a story that starts with potato salad and ends, powerfully, with Burg’s death from cancer. And then, of course, there are the recipes. Molly’s recipes are among my favorite recipes to be found on any food blog anywhere. Her slow-roasted tomatoes? Her butternut squash and chickpea salad? These are classics, and the recipes you’ll find in her book–so far I’ve made the banana bread with chocolate and ginger and Brandon’s (her husband’s) chana masala–are bound to become permanent fixtures in your repertoire. This book will take you to Paris where you’ll fall in love with a boy named Guillaume, it’ll move you to Seattle where you’ll eat Dutch babies in a “bordello chic” apartment, and it’ll inspire you to start a food blog just on the chance that you, like Molly, will receive a charming e-mail from an admirer who will later become your husband. The chapters are short, the recipes inextricably linked to the stories and the whole thing a pleasure to read. But what gives the book its impact, what will keep it fresh in your memory way after it’s over, is the pulsing heart at its center: the love Molly has for her father and the pain she feels over his loss. Two chapters in particular–“Italian Grotto Eggs” and “The Mottling”–brought real tears to my eyes, really made me feel in a way few food books ever do. The very specific details Molly brings to these scenes (the duffel bag her father brings to the hospital, the cereal she eats the morning after he dies) are unforgettable, strangely beautiful in their specificity. It’s no secret that I’m friends with Molly so you should, of course, take all this with a grain of salt. I can’t claim objectivity; she did, after all, shelter me in my moment of need. But I can’t help but feel that if I didn’t know Molly, that if someone handed me this book and said “read it,” I’d open its pages curious, maybe even a bit skeptical, and slowly but ever-so-surely fall in love with her. It’s hard not to: she’s so open, so generous, and so smart. Mostly, though, she’s brave. This is a brave book–the kind of book even the cleverest, savviest food writer would have trouble writing–and for that reason alone, I can’t recommend it enough. It’s a model food book, the kind of book I hope myself one day to write. But to do so, I’d have to write what scares me and that’s easier said than done.